Posted on 2017-12-19 20:52:27 GMT+0000 by Neil Godfrey. This entry was posted in Uncategorized and tagged Ancient historians, Ancient literature, Biblical Scholarship, Book of Esther, Historical Method, Historicity of Jesus. Bookmark the permalink. Interesting! Any other differences to the storyline in the other versions? 137 Many are listed in The Legends 6.456, n. 42. Add to these Midr. Ps. 22/24 on Ps 22:12 (Buber 193; Braude 1.319), and 22/26 on Ps 22:17 (Buber 194; Braude 1.320). The latter passage is a statement by the early Tanna R. Nehemiah. See also the first targum to Esther on 2:1 and 5:1 (Grossfeld 44 and 58), and the second targum on Est 1:12 and 16 (Cassel English 295 and 296). In b. Meg. 12b the reading of the Munich MS is: “Therefore it was decreed that she should be killed naked on Sabbath” (Soncino 71, n. 2). 138 Danby’s translation in The Mishnah 391 is: “The ordinance of them that are to be beheaded [is this]: they used to cut off his head with a sword as the government does. R. Judah says: This is shameful for him; but, rather, they lay his head on a block and cut if off with an axe. They said to him: There is no death more shameful than this.” Billerbeck called attention to this passage in Str- B 1.683 and 270; see also Grossfeld 181, n. 10. The second targum on Est 1:16 (Cassel Aramaic 34, English 296-97) has Memucan, the youngest minister, give his advice regarding execution first. This reflects Jewish legal procedure in a capital case, as prescribed by m. Sanh. 4:2 (Danby 387). On this, see y. Sanh. 4:8(2), 22b, where Est 1:16 is cited (English in J. Neusner, The Talmud of the Land of Israel, 31: Sanhedrin and Makkot [Chicago: University of Chicago, 1984] 142), and Est. Rab. 4/6 on Est 1:16 (Soncino 9.60-61). 139 Their relevance was already pointed out by Wettstein in 1752. See his Novum Testamentum Graecum, Tomus I, p. 413 on Matt 14:11. A baud-y notion, to be sure. The fictional (“mythical” if you like) literary character of certain people and stories in late Old Testament books are easily and casually admitted by Bible scholars. Neil could do a whole series on this. 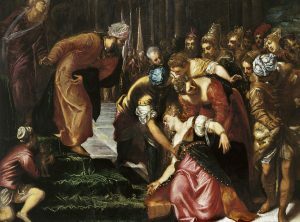 Like Jesus, Judith, through skillful literary motifs, is made to appear “larger than life,” but unlike Jesus, such a powerful portrayal cannot be used to establish historicity. In fact, the portrayal betrays its literary artificiality. You will note that the exact opposite case is typically made for Jesus: because his character is portrayed so vividly, the most natural inference to be drawn is that he was a real person. As noted above, we can add Jonah, which a number of scholars happily admit is one long parable. If only we had a letter from someone who had encountered Esther’s biological brother, that would settle things. Well, hang on. Didn’t Josephus mention her? Esther and Mordecai are of course Chaldean deities Ishtari and Marduk.